Accustomed to a career in what is considered to be a high stress area of her profession, Franki started experiencing symptoms such as shortness of breath and irregular heart rhythm. Forced into retirement sooner than planned, my wife found herself trying to accept life with reduced energy and much more time on her hands. After many tests, she was diagnosed with a cardiomyopathy. The same heart disease which most likely took her father and has since surfaced in other members of her family. As you might imagine, trying to adjust from an active lifestyle to one with limited energy and significant limitations on the ability to exercise was a challenge. Accepting this new reality with all of the future uncertainties that come with it was not easy. But my wife did not give up hope! She believed that with the right balance of medication and measured activity, life could improve. There is an excellent program for heart patients at the Saskatoon Field House. Her recovery was greatly aided by medical professionals advising her about safe levels of exercise and providing dietary recommendations. Accustomed to jogging prior to the diagnosis, it was difficult to accept that walking was her new reality. 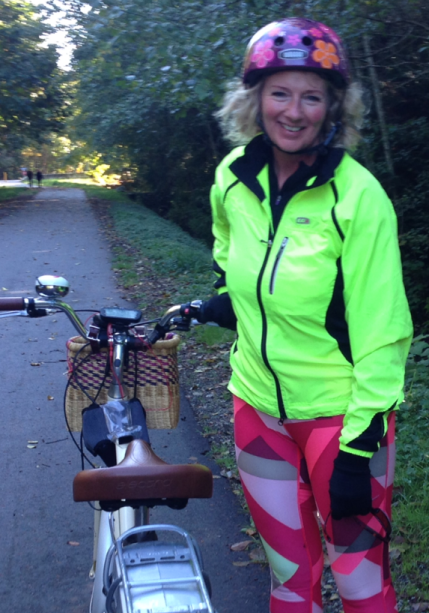 While we were visiting friends at the coast she was invited to go for a spin on a new ergonomically designed bike. As a child she was never really enthused about bikes but she loved the comfortable, upright sitting position that this bike provided. When we returned home to Saskatoon we visited our favorite cycling shop. It just so happened that it was this particular bike that they recommended as the perfect frame to add an electric assist motor. That was just over two years ago and she has not looked back! This bike has become a year round mode of transportation which just turned over 4,000 kms. It provides her the freedom to exercise with the safety that she can always return home on electric assist if required (and she loves the power it provides her to fly past me when we hit one of our few prairie hills). With the right balance of diet, exercise and medication, my wife is now living a life that has exceeded what we both believed possible. I am very proud of her!